Ashgrove’s “Chicken Man”, 87 year-old Alan Kropp, is back cutting the grass thanks to the generosity of Mt St Michael’s College students who pooled together to replace his stolen lawnmower. Mr Kropp, a local identity who spends his days mowing the lawns of elderly war widows, has been fondly adopted by the Ashgrove school which recently acknowledged him as a role model of service to his community. Mr Kropp, who lives near the school, is best known for calling the Mt St Michael’s girls “chickens” which has led to him being dubbed “the Chicken Man”. As well as performing a valuable service for war widows, the sprightly Mr Kropp – himself a war veteran Ð also is known for his participation in RSL Anzac Day activities. When his lawnmower was stolen recently, Mt St Michael’s girls and staff held a fundraiser which yielded about $400. 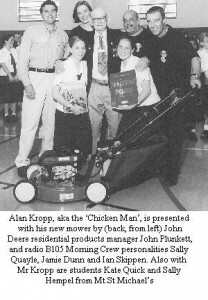 Radio station B105 and a lawnmower manufacturer also heard about Mr Kropp’s plight and came to his aid with the donation of a new mower. A surprised Mr Kropp also was presented with a cheque for $400 which was given to the War Veterans’ Christmas Appeal.